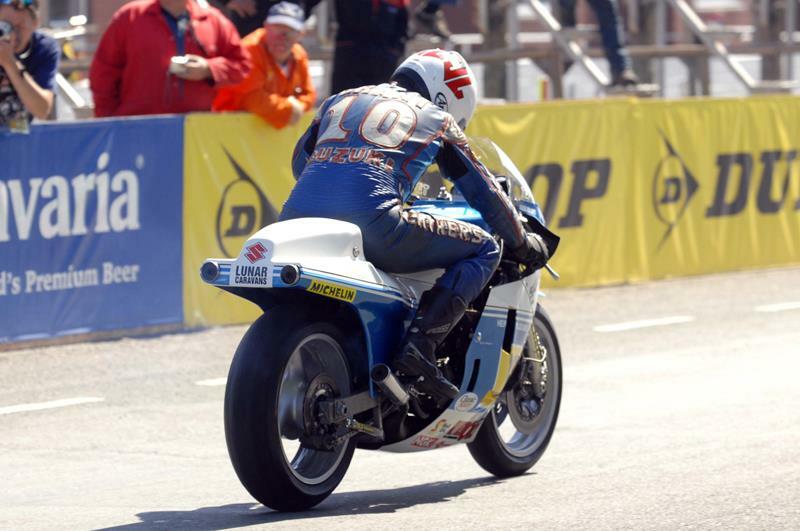 Legendary racers and motorcycles rode an historic parade lap around the Mountain Course to celebrate the Isle of Man TT’s centenary year. Earlier in the week enthusiasts recreate the very first TT race that took place in 1907. However, this time organisers assembled a cast of the finest racers and bikers to have tackled the Mountain course. Highlights included Luigi Taveri’s Honda RC149, Nick Jeffries’ race winning RC30, Mike Hailwood’s 1978 race winning Ducati and Ian Simpson’s 1988 RC45 Honda. Many of the riders put on a show for the crowd with some riders pushing the machines to their limits with several leaving the circuit, however, fortunately without any injury. The star of the show was Mick Grant’s RG500 Heron Suzuki, however, blushes for Rodney Gould who could not get his 250cc Yamaha started on the start/finish straight.